Racine Roofing and Remodeling provides interior renovations in Racine, Kenosha, Sturtevant, Caledonia, Milwaukee, and Franksville, as well as all over Wisconsin. Also known as plasterboard, wallboard, gypsum (calcium sulfate dihydrate) panel, or sheetrock, drywall is made from plaster and mixed with fibre, plasticizer, and foaming agents, as well as optional additives that can decrease mildew, increase fire resistance, and lower water absorption. Next, the mixture is pressed between a facer and a backer (thick sheets of paper), which forms the board after a drying process that results in a rigid and strong enough product to use for a building material. Drywall is used to make interior walls and ceilings. 48, 54, and 96 inch widths. 48 inch is the most common width. Lengths up to 12 feet. 8 feet is the most common length. Thicknesses of ¼, ½, ⅜, ⅝, and 1 inch. ½ and ⅝ inch are the most common thicknesses. 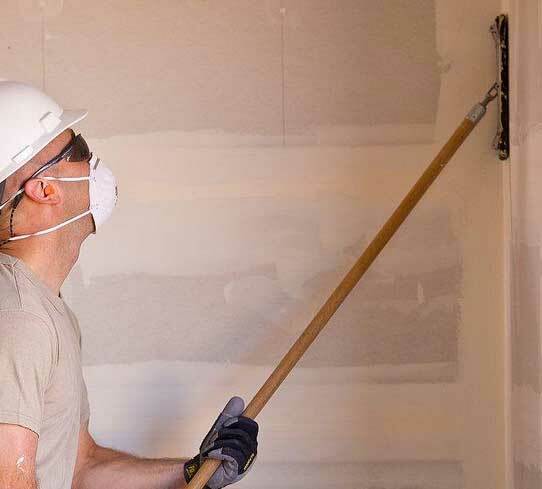 As an alternative to a week-long plaster application, an entire house can be drywalled in a couple of days by experienced contractors, so let our professionals handle the drywall for you. In large-scale commercial construction, the work of installing and finishing drywall is often split between the drywall mechanics, who install the wallboard, and the tapers and mudmen, also known as the float crew, who finish the joints and cover the fastener heads with drywall compound. At Racine Roofing & Remodeling, we use the finest and safest methods to ensure proper taping, sanding, and finishing, leaving limited seams, for the sharpest look.